Joseph Goethe was born in Fort Wayne, Indiana, March 1, 1912. He studied art privately for two years as a scholarship student at Dayton Art Institute, Ohio and the school of the Phillips Memorial Gallery in Washington, D.C. for two years. He also has a one year Fellowship at Huntington Hartford Foundation. Goethe exhibited works in group shows in all the major exhibitions throughout the country and maintained a traveling exhibition of sixteen sculptures in rare woods for ten years. He had more than two hundred showings of this exhibition in colleges, universities, and museums, including one at the American Museum of Natural History in New York City. These works were not offered for sale and all expenses except transportation, were paid by the artist. Goethe exhibited in the 3rd International Sculpture Exhibition at the Philadelphia Museum in 1950; the International Watercolor Exhibition (painting) in Chicago in 1932; the Corcoran Art Gallery, Washington, D.C. where he won 1st prize; and at the California State Fair in 1957 in Sacramento, California. He exhibited in numerous other group shows in Detroit, Dayton, Indianapolis, New York, Philadelphia, Los Angeles, and Chicago. Goethe was the author of "Woods of the World," and the Handbook of Rare Woods" as well as an article on wood sculpture for Craft Horizons Magazine, and sections on wood sculpture for the Encyclopedia Britannica’s 1965 edition. He appeared on radio and television discussing wood sculpture in addition to lectures to classes and private groups. He was an instructor of Sculpture at the Brooks Institute, School of Fine Arts in Santa Barbara, California. I think it is modern man who has discovered the intrinsic beauty and interest of wood and stone. In ancient times these media were almost invariably painted or colored, the form to those old artists taking complete precedence over the possibility of texture and color of their prima material. Today the texture has been given more than an even value with the form depicted, often unfortunately, to the extent of obscuring the inherent character of the wood or stone. In this case sensibility has been overcome by the desire for novelty and such works' interest is without much durability. To love a medium for its own possibilities is one of the fundamental traits of the genuine artist, and the accordance and harmonization of this fully shown body with its formal meaning is one of the most evident aspects of the developed artist. The wood, no matter how beautiful its color and grain, cannot be allowed to outweigh its form nor can its form be twisted or cut so that the wood's character be lost. There is a delicate point and not one for the amateur or the disciple of the fortuitous to succeed in realizing, and this is almost to say that the body and spirit must be in perfect equilibration. With stone also, with its striations, chromatic and formae, the modern sculptor must be in complete accord, for with him no paint or wax, varnish or patina can be called upon to hide his lack of empathy for his medium. I mention these difficulties of which the critic and the artist must be fully acquainted only in order to adumbrate a background for the genuine appreciation of the repeated success in conquering them achieved by Joseph Goethe. I have known his works from the early forties, and I have watched with respect and admiration his unremitting attacks on these very great, nay basic necessities of his art and his self-surpassing. To say that everything this vital man has done is equally a masterpiece would be to imply that he surpasses a Michaelangelo or a de Vinci who certainly had their lesser moments of creation, but to say that in all he does are elements of true greatness would be more than factual. I believe Goethe is entirely cognizant of the imperative necessity of letting his intuition mold the shapes his knife and chisel can so adequately accomplish, for no preplanned and intellectualist formulae could so organically produce the extremely rare sveltezza, the flowing sequence of his linear forms and the evocative shapes that suddenly so rightly appear, all influenced, one might say, interpenetrated with the color-form of his media. Joseph Goethe authored numerous books on woods of the world including rare, exotic, as well as commercial ones. It is clear that Goethe loved both his medium and his craft. 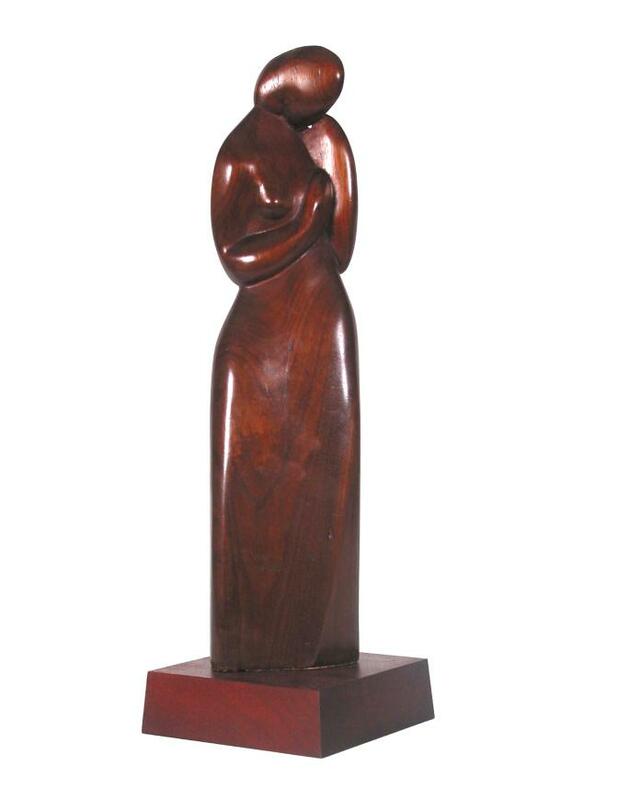 In Woman with Lowered Head this carver has created an organically conceived and singularly contained flowing linear piece that complements the texture and color of the prima material of wood. Goethe has taken meticulous accounting of the grain, the texture, and the color of the chosen wood in order to leverage the maximal beauty potential. There is a touching sense of care and a delicacy of composition in his polishing of this figure. A fluidity and grace as well as a genuine modesty has been imparted to the sculpture that becomes a masterpiece in the hands of an experienced sculptor such as Goethe. The sculpture has been seamlessly conceived with an exquisite balance between material and shape, neither one outshining or overpowering the other. What results is a masterfully carved and harmoniously integrated piece that evokes an aura of timelessness as well as a fresh modern spirit that can be integrated into any classical or contemporarily inspired environment.